As it seems needful to explain why this book came into existence, I may say that as an eager student of Drama, I was anxious to trace out for myself the history of the Scottish Stage. The enquiry, pleasurable as it was, became a somewhat tortuous one. Unluckily for the student, Scotland does not seem to be very proud of its stage connections, with the result that to link the story together one has to become an Autolycus, delving into all sorts and conditions of documents and unsuspected volumes. This role I willingly adopted, and thinking that if I strung my notes together in some historical order, the volume might not be unwelcome to brother Scots at home and abroad, I have pleasure in submitting the result. I have not attempted to go beyond the commencing date of the now popular Touring Companies, mainly because their products cannot be regarded as indigenous to the Scottish stage. If this attempt at laying the foundation should inspire the more exhaustive history really desired, my purpose will have been happily served. I am indebted to many friends for willing services rendered, but I cannot refrain from mentioning in this connection the names of Mr. J. M. Bulloch of The Graphic, Mr. Frank Boyd of The Dundee Courier, Mr. John Duncan of The Glasgow Herald, Mr. H. Thomson Clark, and Mr. J. A. Whamond-Mudie. Bards—Minstrels—Thomas the Rhymer—John Barbour—Andrew Wyntoun —Blind Harry—James I. 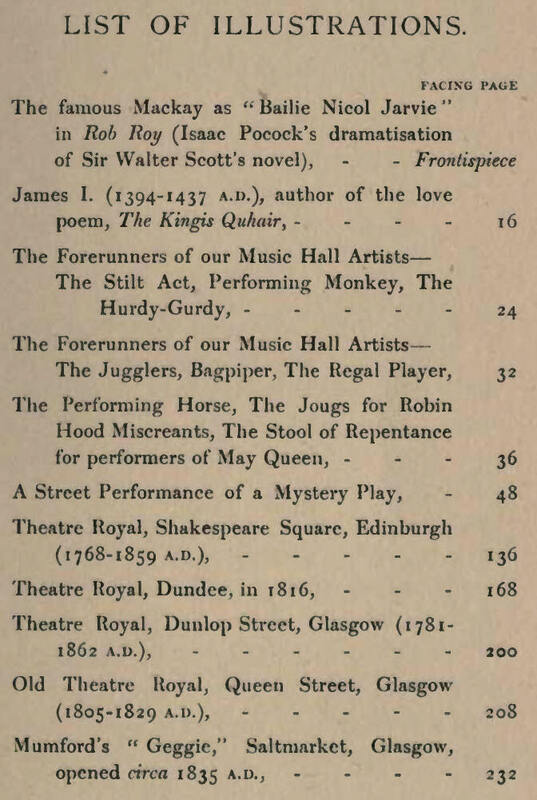 —Henryson—William Dunbar—Gavin Douglas — Guisards—Archery—Robin Hood—Little John—Strolling Players—Forerunners of Music Hall Artists —Scottish Mystery Play—Abbot of Unreason—The Satire of the Thrie Estatis—The May Queen—Moralities—The Censorship—Pageants and Masques. Abbot and Prior of Bon-Accord—The Haly Blude—Mary Magdalene—The Craftsmen's share in Corpus Christi Plays—Candlemas Day functions—Robin Hood and Little John—Penalties for troubling the Lords of Bon-Accord—Parliamentary suppression—The King intervenes—Lawrence Fletcher's Company of Players—Story of Aberdeen Playhouse. James II. grants use of Greenside for sports—The Town Pipers—Harpers. Fiddlers, and Pipers—Pageants—Masques and Tournaments—Dunbar, playwright—Robin Hood Plays—Lyndsay's Satire—Parliament put down Robin Hood Plays and May Queen—Mob attack the Magistrates—Pageant for Queen Mary—The Pomp of the God--The Censor--Penalty for Actors, to be hung as thief. Pageant to James VI.—Reformation helped by Plays—King takes Players under his patronage—Shakespeare's Dancing Horse — Rope-walking — Kirk denounces Plays, and King intervenes—English Players at Holyrood—James VI. 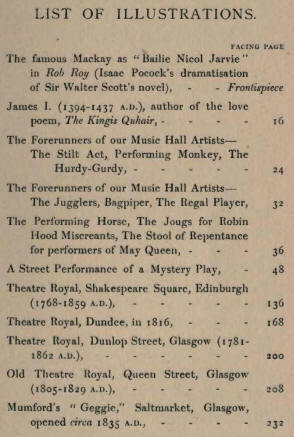 demands revival of May games, etc.—Ben Jonson in Edinburgh —Siamese Twins—Dromedary, Quack Doctor, and Rope-Walker—The Fountains proclaimed Masters of the Revels—Dancing Schools licensed—Irish Players—Parliament patronise The Spanish Friar—Macbeth at Holyrood — Allan Ramsay — Aston's Theatre—Plays at Taylor's Hall—Edinburgh Freemasons patronise the Players—John Ryan at Canon-gate Theatre—High Life Below Stairs Riot. Fire at Canongate Theatre—Production of Home's Douglas—The Kirk takes action—A storm of abuse and ridicule—The Cape Club—The New Theatre Royal—George Whitfield objects-Samuel Foote, lessee—Digges and Bland, lessees—Mrs. Yates--John Jackson, lessee — Mrs. Siddons — Stephen Kemble, lessee—"The Circus"—Henry Erskine Johnstone — Barker's Panorama — Master Betty—Walter Scott and Henry Mackenzie granted patent of Theatre Royal—Henry Siddons fits Corn's rooms as Theatre—Command performance of Rob Roy by George IV.—The Pantheon—Adelphi Theatre—Henry Irving in "Stock." Town Drummers and Town Minstrels--Vain plays at Ruglen—The Council decide to imprison strolling Players—The Temple of Beelzebuh—Giddy young Glaswegians—Teaching of dancing—The Beggar's Opera—BurreII's Close—The first Glasgow Theatre -George Whitfield gets angry—The mob burn the Theatre—Alston Street Theatre—Fanatical mob set fire to it-3lrs. Bellamy—Dunlop Street Theatre erected, 1781—Mrs. Siddons—John Jackson, lessee —The School for Scandal—Master Betty—Jackson's economies. Erection of Queen Street Theatre--The Black Bull Inn—Harry Johnston—George Frederick Cooke—Edmund Kean—Charles Kean—Miss O'Neill—Theatre illumination by gas—First Scottish performance of Rob Roy—Sheridan Knowles—Ellen Tree-James Aitken—The rival lessees in Dunlop Street—Duerow's Stag Hunt—York Street Theatre—G. V. Brooke—Mr. and Mrs. Charles Kean — Adelphi Theatre—Samuel Phelps—Mumford's "Geggie"—Edmund Glover—Helen Faucit—Professor Anderson's City Theatre—Calvert's "Queen's" Theatre. Guisards—Saint Obert's play—Church licenses Coinpany of Players— Spectacle at South Inch—Pageant to Charles I.---Perth Grammar School presents flays —Theatre in a flat—Guild Hall Theatre—Glovers' Hall Theatre—The Theatre accident—St. Anne's Lane Theatre—Neil Gow—Mr. 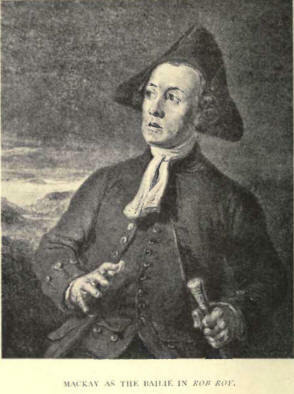 and Mrs. Henry Siddons—Corbett Ryder, actor-manager—Mackay as mimic—Rob Roy—Opening of Theatre Royal —Macready—First Pantomime—Edmund Kean—Caledonian Theatre Company—C. Bass, lessee—A Penny Gaff—Hooper's Touring Company—John Wilson, the Scottish tenor—Paganini—Cooke's Circus—Wombwell's Menagerie —Sheridan Knowles —The African Roscius—Helen Faucit.